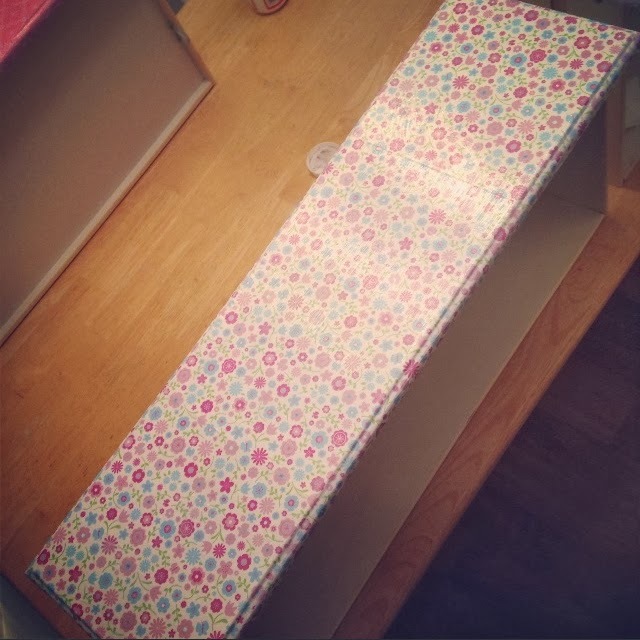 So you have a plain, boring dresser sitting in your house that you've been dying to makeover and you have no idea what to do to it. Sure, you can paint it, but primer, paint and sealer add up! Not to mention, would take a lot of time. The alternative? Get ready to become completely obsessed with it. In fact, if you plan on doing this project, splurge for the big bottle, you'll be glad that you did! This Saturday DIY only took 1 day to complete and even better, it cost under $10!! I already had the dresser on hand and the knobs went with the new style perfectly so, I did save cost there. Mod Podge is usually around $8, download the Joann's app and you are bound to find a 40-50% off coupon! The sponge applicator, less than $1 at all craft stores and JoAnn's almost always has scrapbook paper on sale. I got mine 3 sheets for .99 cents. 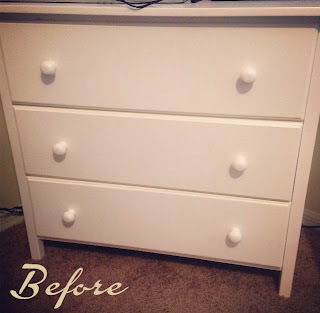 Here is my plain, white dresser....boring! First things first, remove all the hardware. Sand the front of each drawer. This doesn't have to be done any special way. 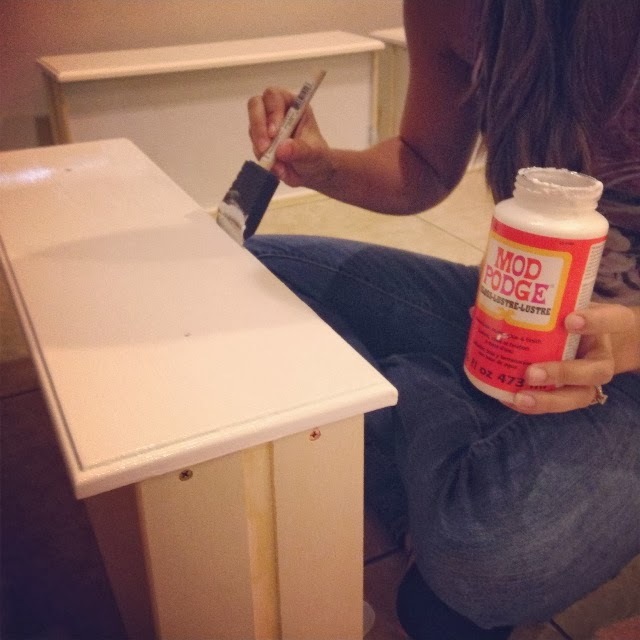 You basically just want to rough up any coating so the mod podge sticks better. I also sanded around the edges of the front piece of the drawer, but that's the only part of the drawer you will be working with. The next few steps will be the most tedious, but its smooth sailing from there! Lay out each drawer's paper. Here you want to match up the designs and trim away the overlapping excess so that when you put all the sheets side by side the pattern continuously flows. I used a metal ruler as a straight edge and a skinny box cutter. Through trial and error I found it was easiest to keep the middle sheet as is and match up/trim the 2 end sheets. It's very important that you keep your paper lined up in the order that you trimmed it so the pattern matches up. 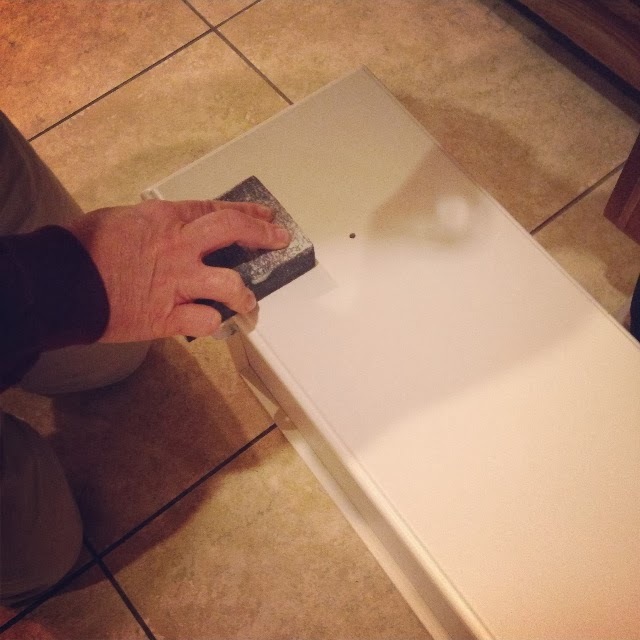 Apply the middle sheet first to the center of the drawer. Using your scraper begin to smooth out any bubbles. Don't press so hard that you end up ripping the paper. It's a delicate process because the paper does become wet from the mod podge. Now you can line up and apply both your side pieces following the same technique. 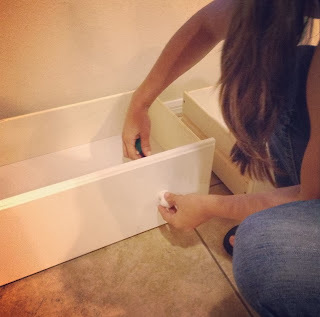 If your drawer has decorative edges, focus on the main flat surface first. Then, carefully start to form the paper over the edges and around the corners. Use your scraper to crease the paper into any crevices. 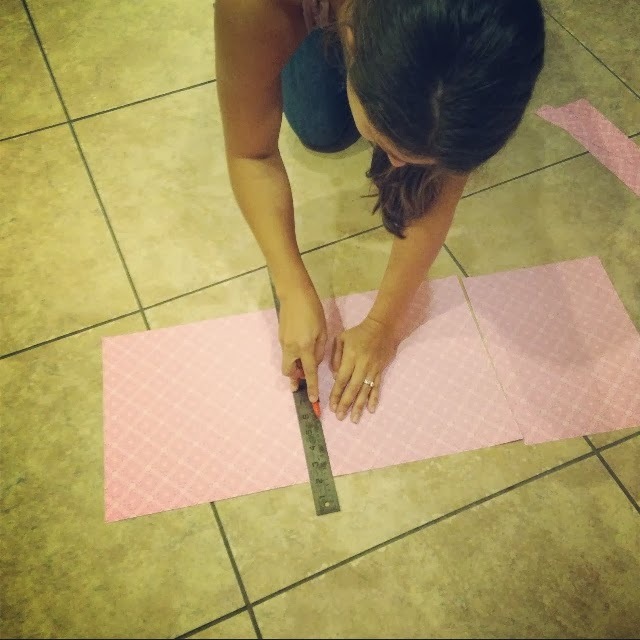 In order to get those corners good you may need to trim off excess paper. This part was tricky for me and I never really got a good system down for the corners. Just get them wrapped as best you can, but careful not to rip the wet paper. 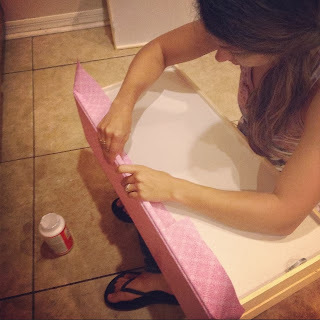 Add more mod podge to the sides and back of the drawer as needed if you find the paper not staying put well. 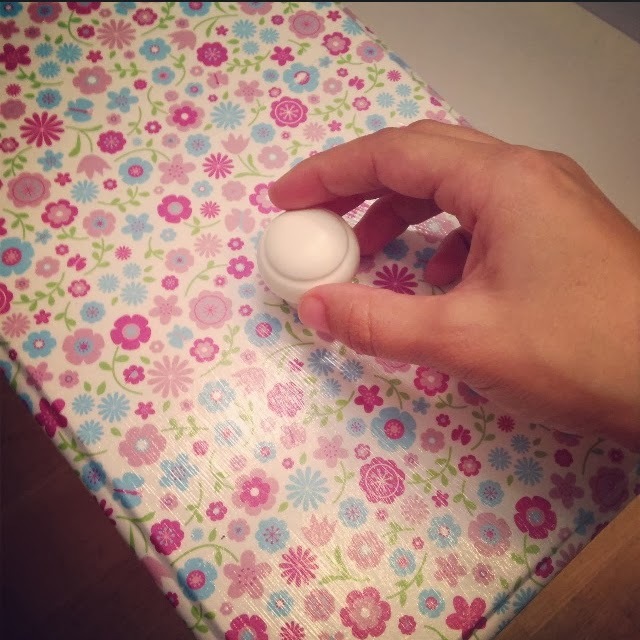 Once you have the paper completely wrapped around to the backside, set it aside to dry and move on to the next drawer. 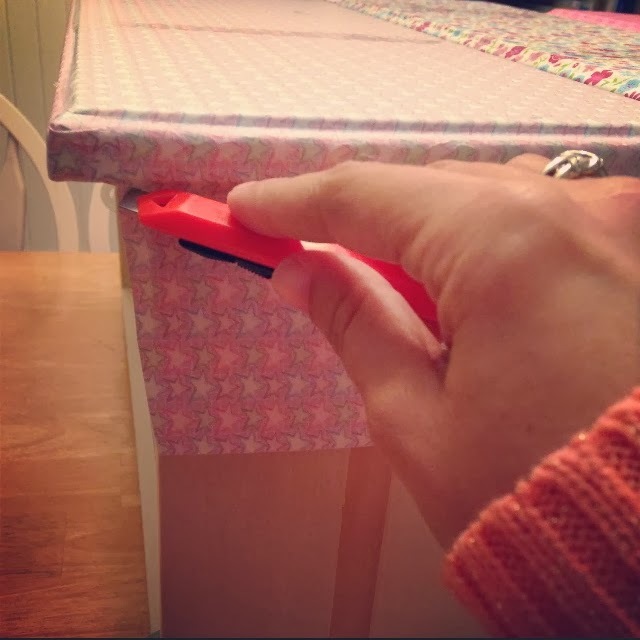 Once all your drawers are covered and completely dried, you can trim away any excess paper with an exacto knife or small box cutter. You're almost done!! 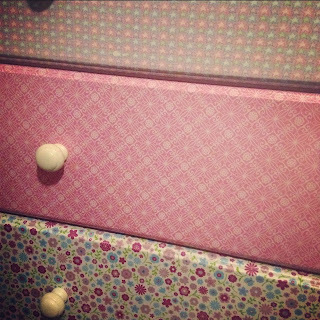 For each drawer you just want to completely cover it with mod podge. This is going to act as your sealer. Do 3 coats per drawer letting each dry for about 5 minutes in between. When the last coat has completely dried, you can add your hardware. To find the hole I just poked the screw through from the back to make an indention. 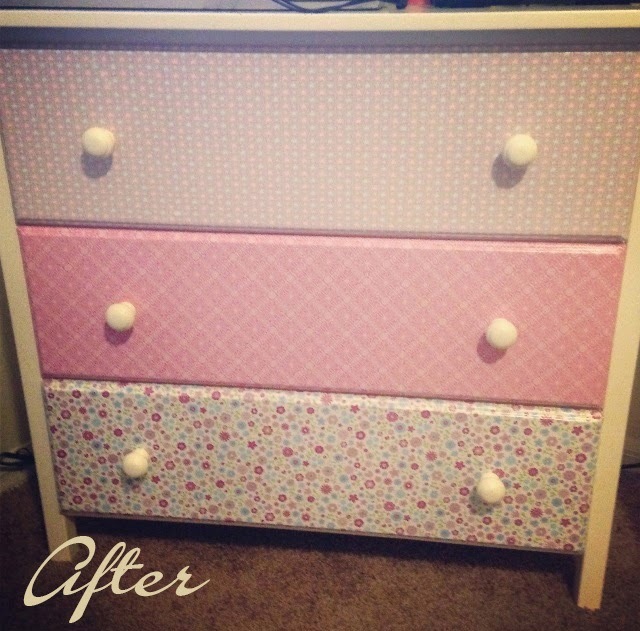 A new and improved dresser! Have you ever revived a boring piece of furniture? Was it complete success or epic fail? and see your before and afters! Very frugal, a great way to repurpose and old piece of furniture. love this idea. do you think fabric would work instead of scrap paper? Thank you. Yes, fabric would absolutely work. 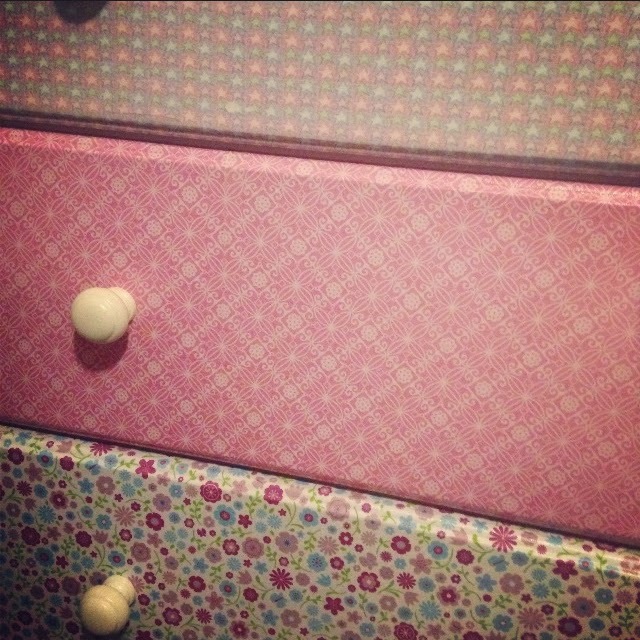 I have a dresser I'm dying to redo with lace!